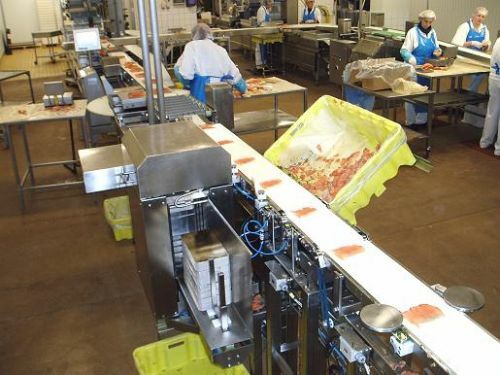 From a “slicer” fall salmon slices down on a conveyor belt which feeding the slices to a process scale. Each slice is weighed and the smallest sorted out. After sorting, it is possible to turn around the slices 180 degree in connection with the stacking on plates. A plate feeder feeding the plates one and one to a belt conveyor positioned at the stacking. After the stacking the weight is controlled by a checkweigher. Approve plates are fed directly to the vacuum packer and remaining in a return system for manual shift, and then through checkweigher to the vacuum packer. The packaging line is made in stainless steel AISI 304 and materials approved for foodstuff. All parts are constructed for a high hygienic standard and easy cleaning.